A brand new, entry level case sealing machine, which can be enhanced with a range of technical options to meet customers specifications, has been launched by end-of-line automation specialist, Endoline Machinery. For the last 12 months Endoline have been catering to a growth in demand by almost 40% from food and FMCG manufacturers, particularly within the SME sector and overseas, looking for automation with a fast ROI. As manufacturers feel the hit from retailers who continue to squeeze profit margins, ROI can be a real deal breaker when it comes to purchasing machinery; however they are unwilling to compromise on quality. The new 611 Entry Level Case Sealer offers a low investment for manufacturers built to Endoline’s typical high quality – but with the added option of technical enhancement further down the line if required. One of the additional options includes the integration of a dual action hook system, with fully interlocked guarding, if a customer is running heavy duty twin wall cases. 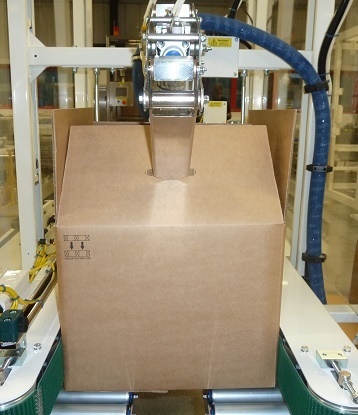 Twin wall cases are essential for customers who export their product as they offer added durability during transportation; however they are inherently difficult to handle for packaging machinery due to their stiff nature. The dual action hook system ensures that the inner flaps of the case are effectively pushed into place before sealing, which overcomes tearing or the risk of the case opening at a later stage. As systems become increasingly intelligent Endoline can also enhance the 611 to meet a customer’s requirement to include specific electrical and mechanical components advised by the customer. The machine can also be modified to run cases outside the standard specification of the machine.